It is my absolute pleasure to introduce Professor Nidhal Guessoum as a guest blogger on Irtiqa. I met Nidhal at the recent Darwin's Legacy conference at Alexandria. He is an Algerian astrophysicist and Professor of Physics at American University of Sharjah. Nidhal received his MS and PhD in physics from University of California at San Diego. His astronomy research focuses on gamma-rays from the Milky Way (and from other sources in the universe), but he has also been writing about science and religion issues, with an emphasis on Islam. Oh - and he is fluent in English, French and Arabic (at least these are the three I know of...). It was a delight meeting him in Alexandria and I'm grateful that he accepted my invitation to guest-blog here. We may not agree on everything regarding science & religion, but we do share a common interest in promoting science in the Muslim world and in understanding the ways Muslims are responding to modern science. France is arguably the country where Science-and-Religion discussions are most controversial, for anything but a separationist stance. Whereas Oxford and Cambridge have S&R centers (The Ian Ramsey Center and The Faraday Institute for Science & Religion, respectively), in France the phrase “Science and Religion” hardly ever appears in the public discourse of intellectuals. And anyone attempting to import the anglo-saxon debates of S&R will quickly face accusations of “accomodationism”, if not of downright stealth attempts to reinject religion into the intellectual arena. 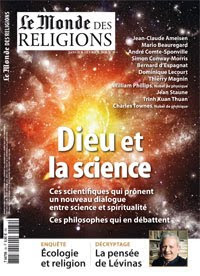 Now, how does a magazine like Le Monde des Religions treat the question of God (or Religion) and Science? The 30 pages were divided into two parts: (a) high-level scientists who prone a dialogue with religion or find no conflict in being religious; (b) the view of the philosophers. It is interesting to note that a large majority of the scientists who presented their pro-religious views are anglo-saxon, including Simon Conway-Morris (evolutionary convergence and predictability) and the Nobel-prize winners Charles Townes and William Phillips. One may add Trinh Xuan Thuan, a US citizen of Vietnamese origin who spends several months a year in France and has published such best sellers as “La Melodie Secrete” and “Le Chaos et l’Harmonie”. The two big French exceptions to the group are Bernard d’Espagnat (who won the Templeton Prize last year for his “veiled reality” interpretation of Quantum Mechanics) and Thierry Magnin (a doubly practicing scientist and catholic priest). On the philosophical side, I should highlight the 6-page debate between Jean Staune and Andre Comte-Sponville: the first one sees in recent scientific “paradigm changes” (quantum entanglement, fine tuning in the universe, convergence and other developments in evolution, studies in neuroscience) grounds for rapprochement between the scientific worldview and those of the great spiritual traditions and insists that materialism is now untenable; the second one believes there is nothing new (philosophically) in these advances and, while he admits that there is some “mystery” in nature, rejects the need for a religious worldview (he calls for “spiritual atheism”). Other complementary views are provided by Dominique Lecourt, a philosopher of science, and Jean-Claude Ameisen, an immunologist and ethics specialist.